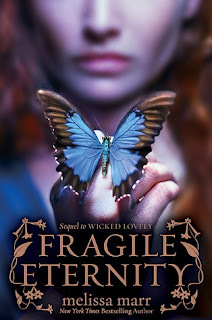 Synopsis: Aislinn never expected to rule in Faerie--but that was before Keenan stole her mortality to make her a monarch. Now she faces challenges and enticements beyond any she'd ever dreamed of. Seth never expected he would want to settle down with anyone--but that was before Aislinn. She is everything he's ever dreamed of, and he wants to be with her forever. Forever takes on a new meaning, though, when your girlfriend is an immortal faery queen. My Review: I wasn't sure if I was going to like the rotating of the stories; each book focusing on different members of the same tale. However, everything is so intricately connected, as well as the characters, that each book is more like a different side, a different perspective and point of view from the story. Had it been written any other way, I would have felt cheated. This time around we get to see things through the eyes of the only one to remain 100% mortal and who willingly stays with the faeries - Seth Morgan. If you haven't read my review of Wicked Lovely, let me inform you that I love Seth. Always with the right words at the right time. The only mortal to not only freely move throughout a few of the Faerie Courts, Summer, Winter and Dark; but to also have close relationships with all of the Courts' kings and queens! Seth sometimes has a hard time being around faeries all the time, even Aislinn now that she's immortal. She's his forever girl, but, he's the only one that won't last that long. Spending time with her reminds him of how different she's become and how fragile he is as a human. The problem in this book is that Seth has become a little too popular among the fey for his own good. So popular, that Bananach in particular has become quite interested in him. We all know that in the wake of Bananach is nothing but death and destruction. One thing I've learned about the raven-haried faery is how she likes to get what she wants and to do so, she whispers into the ears of others, recruiting them to unwittingly do her bidding. The High Court is another one of the Faery Courts, whose Queen is Sorcha. She is mentioned in the earlier books but never discussed in depth or introduced in the actual story (unless you read Old Habits). Sorcha's role is to maintain order; not like faery police but her mere existence keeps all of Faerie balanced. Yet, Sorcha begins to have feelings and emotions that are irrational and therefore are disrupting the balance and there is only one unexpected person that can fix everything. As if all that wasn't enough - the problems between Aislinn and Seth, Seth and Bananach, Seth and the other courts - things between Keenan and Donia get even more complex. Loving each other and it being impossible to be together makes it hard to cope. There is tension between the courts and Seth is right in the middle of it all. The tension comes directly from Nial, Keenan, Aislinn and Bananach; each of them trying to remind the other of their own strength. Okay, even though I've already sworn my fealty to Seth, there's a large part of me that really wants Keenan and Aislinn to be together, I would hate for Seth to be dumped but I'm sure there a nice Summer Girl out there that could serve as a pleasant distraction. Overall: There are unbelievable twists, turns and surprises. You can't stop reading this series, you have to know what's going to happen next. Right now everything is a mess and I need to know how we're going to fix it so that everyone gets what they want, everyone is where they want to be and with the one they want to be with? I need my happily ever after here! If I didn't have the whole series and was unable to read them back to back, I would go mad! I have not read any book in this series but your review has brought on my appetite! What is the first book in this series! Thanks, this was a great review.